In a medium-sized ovenproof bowl, combine the butter, oil, water, sugar, and salt. Place the bowl in the oven for 15 minutes, until butter is bubbling and has started to brown at the edges. When done, remove the bowl from the oven (the mixture may splatter a bit), dump in the flour and stir it in quickly, until it comes together and forms a ball that pulls away from the sides of the bowl. Remove from the oven and patch any sizable cracks with reserved dough. Let shell cool before filling. Slice the tomatoes and set them aside to drain in a colander. In a small bowl, whisk together the chives, thyme/tarragon, ricotta, mascarpone, heavy cream, and egg. Season with salt and pepper, then set aside. 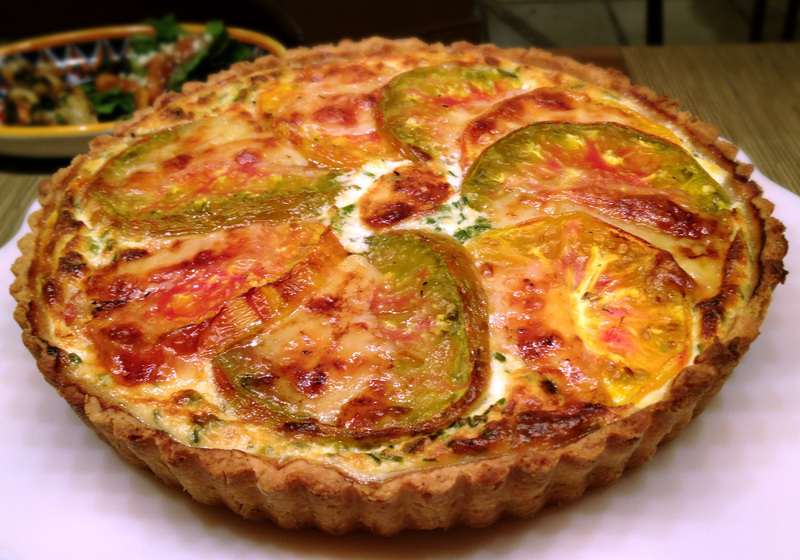 Spread a thin layer of Dijon mustard along the base of the cooled tart shell. Let sit for a few minutes to dry out. Arrange the uglier tomato slices over the mustard in a single, even layer. Rub a little olive oil onto them. Pour the chive-ricotta mixture on top. Arrange the prettier tomato slices on top, alternating with thin slices of Emmantaler cheese. Drizzle with some honey, if using. Bake for 35-40 minutes, until the tomatoes and cheese have started to brown and the chive-ricotta mixture has set.